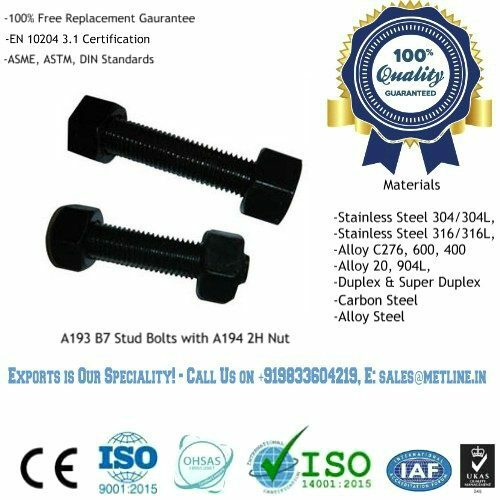 Duplex 2205 Fasteners Manufacturers & Suppliers – Buy Top Quality Duplex 2205 Fasteners! Metline is a full line manufacturer of Duplex 2205 fasteners, nuts and bolts in accordance with DIN, ASME, ASTM and ISO standards. 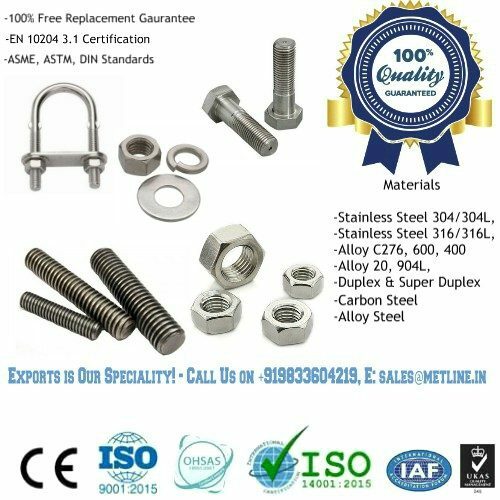 The most commonly used Duplex Alloys for manufacturing fasteners, nuts and bolts are Duplex 2205, Super Duplex 2507, Duplex UNS S31803. Metline offers a complete range of Duplex 2205 fasteners such as screws, hex bolt, hex nut, flat plain washer, anchor bolts and U bolts. Metline is a specialist manufacturer of Duplex 2205 fasteners in size range of M6 to M100, 1/4″ to 4″ in standard and custom lengths. UNS S31803 is a typical duplex stainless steel very similar to UNS S32205 except that it may have a bit lower content requirement of chromium, molybdenum and nitrogen. Generally, both UNS 31803 and S32205 can be called as “Duplex 2205” in practice. UNS S32205 or DIN W.Nr. 1.4462, duplex 2205 is an austenitic & ferritic two-phase Cr-Mo-Ni alloyed stainless steel which has a roughly mixed 1:1 ferrite and austenite structure. It is the most widely used duplex stainless steel grade and is characterized by high-yield strength, double that of standard austenitic stainless steel grades. Piping components made from duplex 2205 have good fatigue strength, as well as outstanding resistance to stress-corrosion cracking, crevice, pitting, and general corrosion in severe environments. They are widely used in chemical processing, oil & gas piping, marine & high chloride environments, pulp and paper industry, and food industry, etc. Duplex 2205 materials can be furnished in the form of plates, bars, pipes, tubes, fittings, flanges, and valves in accordance with relative standards such as ASTM A240, ASTM A479, ASTM A484, ASTM A276, ASTM A789, ASTM A790, ASTM A182, etc. UNS S32750 or DIN W.Nr. 1.4410, Duplex 2507 is a super duplex stainless steel with 25% chromium, 4% molybdenum, and 7% nickel designed for demanding applications which require exceptional strength and corrosion resistance, such as chemical process, petrochemical, and seawater equipment. The steel has excellent resistance to chloride stress corrosion cracking, high thermal conductivity, and a low coefficient of thermal expansion. The high chromium, molybdenum, and nickel levels provide excellent resistance to pitting, crevice, and general corrosion. A nut is a type of fastener with a threaded hole. Nuts are almost always used opposite a mating bolt to fasten a stack of parts together. The two partners are kept together by a combination of their threads' friction, a slight stretch of the bolt, and compression of the parts. ASTM A 194 Gr. 2H, 2HM, G4, G7, G7M, A563/A563M Gr. A, B, DH / 8S/ 10S.